Prentice hall writing coach is a digital grammar and writing program for grades six through 12. Quality and Effectiveness: For the more experienced student who can copy and paste his or her writing into the software and get immediate feedback, this product is genius. The ability to set levels for student use is helpful, but struggling writers would need support to use this software. Ease of Use: The navigation in some areas is generally user-friendly. a pop-up box would be helpful for answering questions quickly. Top Features: The e-text book is well put together, effectively written, and educationally sound; the student can get good feedback and make changes to written work before submitting it; this product reinforces what is already being shared in the classroom, and it is available to students 24/7. 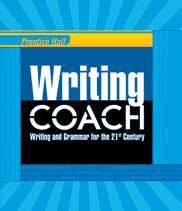 Overall Rating: The Prentice hall writing coach will help the average user or higher-level student become a better writer.